Below is the late Pick 4 ticket for January 26th, 2019 at Gulfstream Park. The $24 ticket is a touch more than I usually spend, but felt it was well worth it with a 20-1 single in the sequence. Unbridled Juan (#9, 8-1) appears to be better than ever and loves this one mile distance. He is a bit of a grinder, but there is plenty of speed in this race to set things up for him. Stronach Stables will be going full-bore to win a race on Pegasus Day. Coal Front (#1, 9-5) dazzled in the Mr.Prospector over this track last month and a repeat of that effort will make him very tough in here. He will have company on the front-end, but may simply outrun his competition throughout. Cooper Town (#8, 6-1) is the ‘other’ Pletcher in this spot and offers great value at 6-1 considering he was 2-1 in the Grade 1 Cigar Mile last time out. He ran poorly that day, but he broke slow and may have bounced after winning off a layoff in his previous start. If the true Cooper Town shows up, he will certainly be in the mix. Aztec Sense (#6, 7-2) is in career form and has reeled off 8 consecutive victories. This will be the toughest test he has faced, but the Navarro trainee is far too sharp to ignore. Hunter O’Riley (#9, 20-1) would be 2-1 morning line in this race off of his two efforts at Saratoga. He followed those up with two subpar efforts and has been freshened to try to get things back on track. Jimmy Toner is a very patient trainer and I view the fact that he decides to bring him back in a stakes as a sign of confidence. He was gelded a month ago and has worked extremely well since then. To top things off, the best turf rider in the country, Flavien Prat, signs up to ride. All signs point to go for this comebacker, who will make this sequence pay well at 20-1 on the morning line. Aerolithe (#4, 8-1) invades from Japan to face a field that lacks a clear standout. Facing males is nothing new to this talented mare as she has defeated them on multiple occasions. Her connections feel she will thrive in American racing and it is easy to see why. Her best races have come going around left-handed turns on firm turf courses. It also does not hurt that she gets in at just 112 pounds. 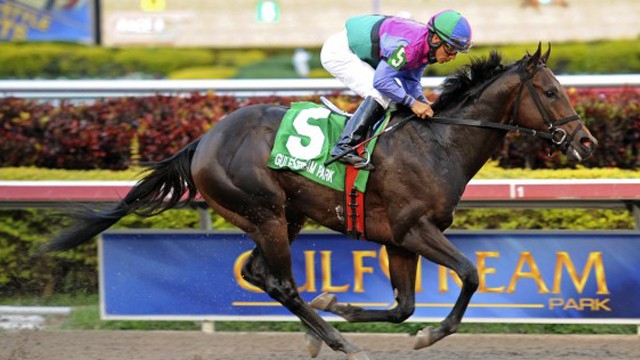 Channel Maker ( #3, 12-1) was in razor sharp form prior to running a dud in the Breeders’ Cup. If you throw that race out, he fits extremely well with these. He should sit a great trip tucked in behind the speed and offers great value at 12-1. Yoshida (#2, 5-2) is just as effective on turf as the dirt and brings class to this race. Jose Ortiz appears to have chosen this runner over Channel Maker. I’ve always thought he was better on a soft turf, so elevate his chances if it rains. Magic Wand (#1, 9-2) is a very talented filly who disappointed a bit when running 4th in the Breeders’ Cup Filly and Mare Turf. She can easily win this race on her best day, but usually horses in Europe are given a vacation this time of the year and she may need one to return to her best. She will appreciate firm turf if the rain holds off and like Aerolithe, gets in at a feather weight of 112. Audible (#10, 10-1) ran into a perfect storm of negatives last time out when losing at 1/9. He caught a sloppy track, was wide throughout and likely bounced after winning off a layoff. His pattern reminds me of Mind Your Biscuits, who lost an allowance race at Gulfstream at very low odds in a clear prep before his big win in Dubai. Audible’s Florida Derby win came at this track and distance and he offers both upside and value in this spot. While Accelerate and City of Light were cranked up for top efforts in the Breeders’ Cup, Audible’s campaign has been geared for a peak effort in this race. City of Light (#3, 5-2) has never been better and handed Accelerate his only loss of 2018. The consistent colt shook off a fast pace in the Breeders’ Cup Dirt Mile and just kept powering away. He is working lights out for this race and the only real drawback is taking a short price on a horse who is likely better at 1 turn. Accelerate (#5, 9-5) brings an almost flawless 2018 resume into his final race. He is a standout on paper and is clearly the horse to beat. He drew well and will try to join Arrogate and Gun Runner in capturing the Breeders’ Cup and Pegasus double. My only hesitation with Accelerate is whether or not he emptied the tank in the Breeders’ Cup after a long campaign. That is certainly a possibility and 9-5 is a short price to find out. This is the reason he is not a single, but he certainly should be included in all horizontal wagers.